Dr. Elizabeth Wells led the group and shared her knowledge of plants. On a walk that FODM announced as a “plant walk,” 25 Dyke Marsh enthusiasts enjoyed the flora, fauna and more on a balmy September 9, 2017, in Dyke Marsh. Retired George Washington University botany professor Elizabeth Wells led the group along the Haul Road trail out to the boardwalk for almost three hours. Ms. Wells depth of knowledge and the rich biodiversity of the marsh easily held everyone’s attention. Glenda Booth has contributed the following photo essay highlighting many of the observations made on the walk. The swamp dogwood (Cornus amomum or C. stricta) likes the edge of fresh water streams and marshes. 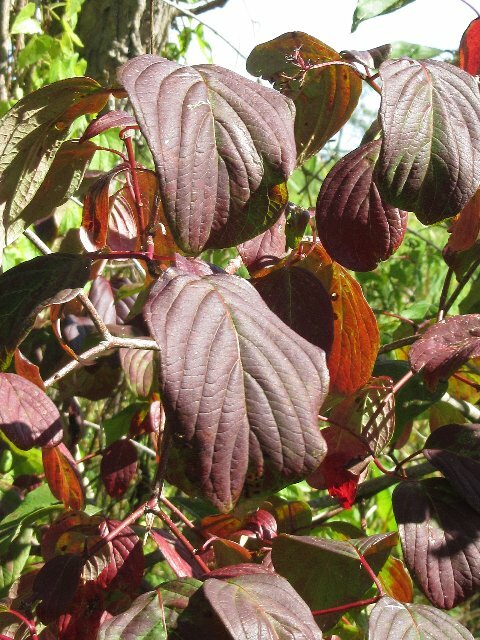 The shade of red in this picture is characteristic of swamp dogwood in the fall. 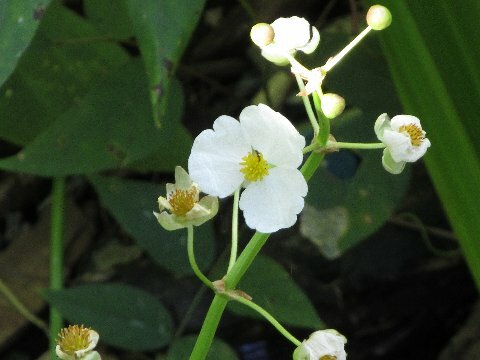 The broadleaf arrowhead (Sagittaria latifolia), also called duck potato, was in bloom. 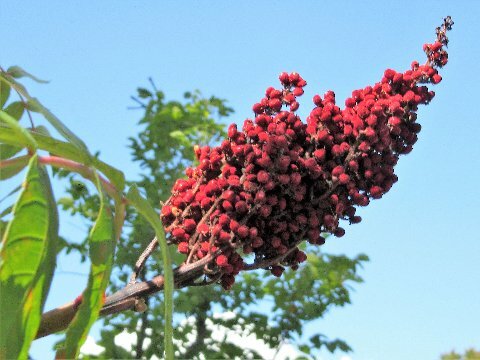 The smooth sumac (Rhus glabra) has a beautiful red fruit in the fall. 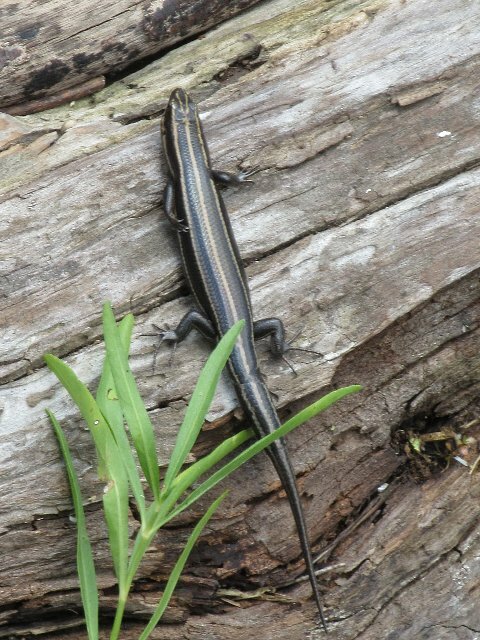 Several adult five-lined skinks (Plestiodon fasciatus) were seen on the walk. 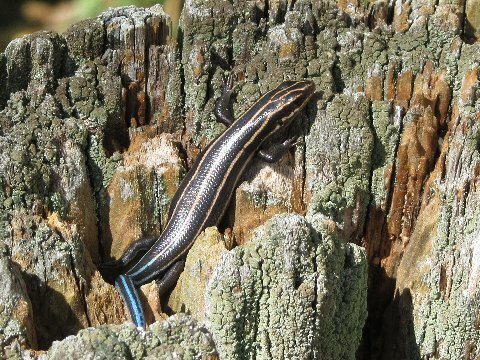 Young five-lined skinks (Plestiodon fasciatus) have blue stripes on their tail, but the stripes darken as the skinks mature. The button bush (Cephalanthus occidentalis) plant produces ball-shaped flowers. 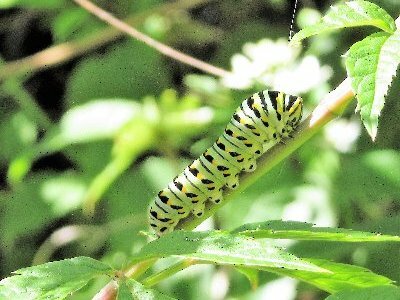 Keen observers spotted the first instar stage of the black swallowtail butterfly (Papilio polyxenes). 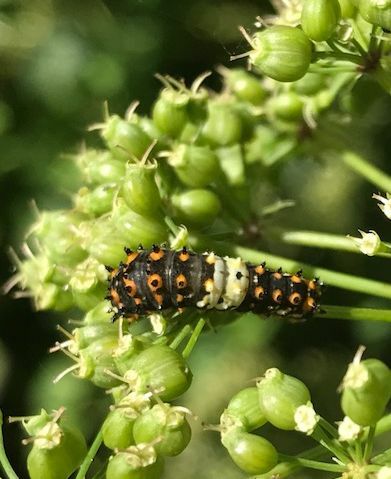 The caterpillar or full-grown larva of the Eastern black swallowtail butterfly (Papilio polyxenes asterius) was on its host plant, the water hemlock (Cicuta maculata). 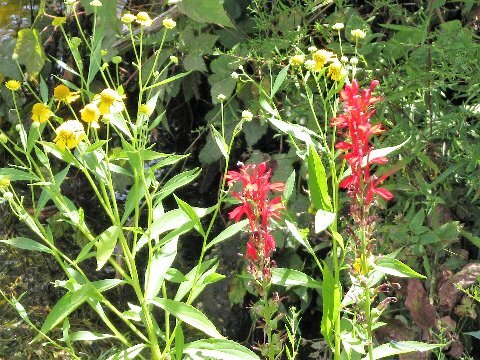 The scarlet red cardinal flowers (Lobelia cardinalis) and sneezeweed(Helenium autumnale) were growing at water’s edge together. 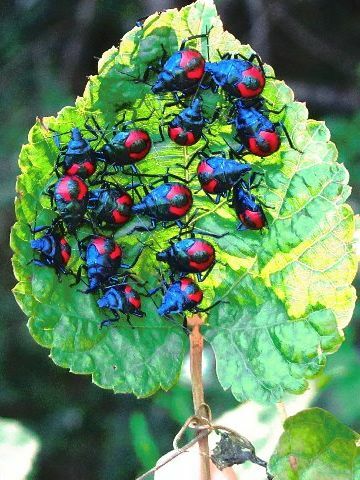 Walkers spotted the nymph masses of Florida predatory stink bugs (Euthyrhynchus floridanus). 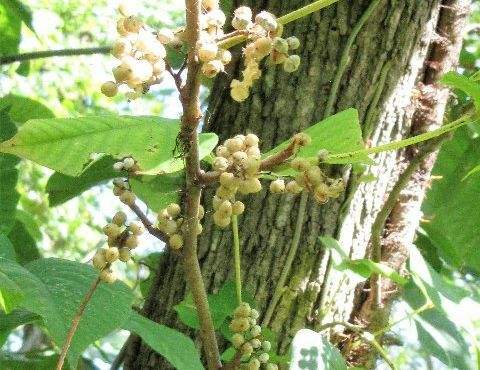 Some poison ivy (Toxicodendrn radicans) vines were showing their berries, great food for birds. 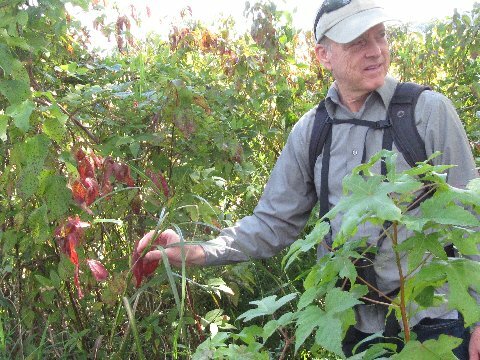 Former FODM president Ed Eder discussed the river bulrush (Bolboschoenus fluviatilis), an imperiled plant.